Sometimes what you see and what your camera sees are very different. This was the case on a recent fall foliage hike I took a few weeks ago. It can really mess with your head – “my photos are terrible” and the like. 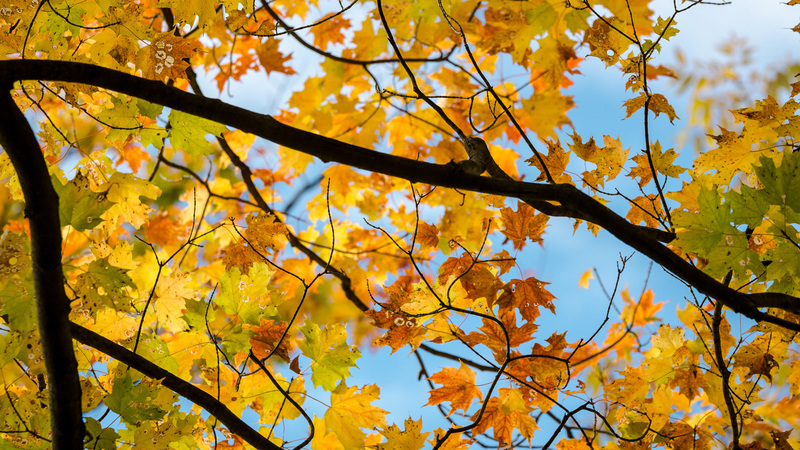 Luckily with a few specific sliders in Lightroom, we can bring your fall foliage photos back to life. Let’s take a look. For the purpose of this article, we’re only going to start with a blank slate. We’ll walk through basic adjustments and then add the “finishing steps”. If you’ve already gone through basic adjustments, feel free to skip down below. When I start working with an image in Lightroom I begin with the Basic panel. Although counterintuitive to the panel’s layout, I start with Whites and Blacks. Use the Whites slider first, moving it to the right to brighten the whites in the image. Hint: Hold down the Alt key (Option key on Mac) to see if you’re clipping any whites while you’re dragging the slider. Do the same with the Blacks slider – drag it to the left to darken the blacks. Again hold the alt key (Option key on Mac) to see if you’re clipping. It’s okay to have some clipping in the image. In mine, I have clouds in the upper corner – I expect them to be bright white. I also have a dark tree branch in the center of the image that I’m trying to silhouette – it should clip a bit. Next, adjust the highlights and shadows sliders. It really depends on the individual image as to how far you pull down the highlights or open the shadows. I tweaked them just a bit in this image. At the bottom of the basics panel, you’ll find the Presence section. Generall, for fall foliage, I’ll add a bit of clarity to the image. It helps add grit and structure to the leaves. Don’t add too much clarity or you’re image will look over-processed. Try adjusting the Vibrance slider. Vibrance adds selective saturation to the areas that need it most. When I drag the slider in this image, it adds saturation to the blues in the sky and it doesn’t look good at all. I just double-click the slider to reset it back to zero and leave it at that. Next, I scroll down to the Lens Corrections panel then toggle the “Enable Profile Corrections” checkbox. Sometimes I like the way it corrects the lens distortion…other times not so much. For this image, it really doesn’t make a difference and I like it the way it is, so I’ll leave it unchecked. So if the Vibrance slider doesn’t work and I don’t want to saturate the entire image, where do I go next? The real magic happens in the HSL panel. Inside the HSL Panel, we have 3 options – Hue, Saturation, and Luminance – I can adjust each one for every color in the image. Let’s start with the Saturation section. I adjust the saturation of the red, orange, yellow, and green leaves up. I drag the slider all the way to the right, then drag it back until I’m happy with the look. I’m careful not to oversaturate. The sky looks a little dull, so I’ll increase the Blue saturation as well. In the Luminance tab, I make the yellow leaves pop by increasing the brightness. Pretty neat, huh? Using the HSL panel, I can selectively increase saturation, brightness, and even shift the hue of some colors. It’s the easiest way to make images look great without needing to use a brush or filter for detailed enhancements. Wrap it up with a little bit of Sharpening and a Vignette, and it’s done!